How do we respond when a man about to be inaugurated as President of the United States would flunk the behavior guidelines of every kindergarten in the country: no name-calling, no touching someone else’s private parts? 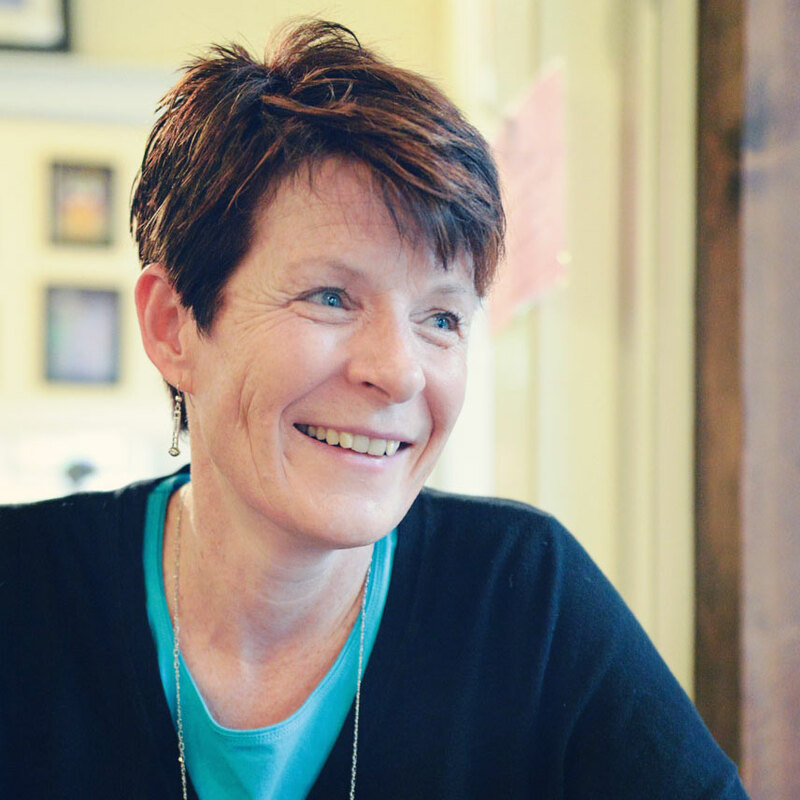 When the election was tainted by scandal and voter suppression? 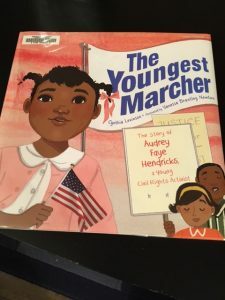 For many young children, protest marching may be a new concept. They may not be aware of Black Lives Matter demonstrations over the past year; they have not known a country led by a white president who disrespects women, who lashes out at Muslims, Mexicans and civil rights icons, who threatens mass deportations. 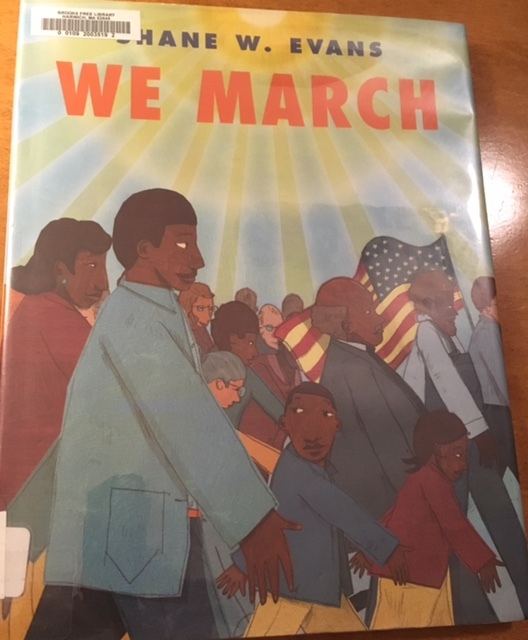 As parents, we explain that as citizens, we can demonstrate, we can march, we can protest. And we can use books to teach our children about these tools of democracy. 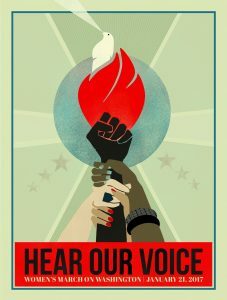 The message is spare and powerful in We March, written and illustrated by Shane W. Evans (Roaring Brook Press, 2012). 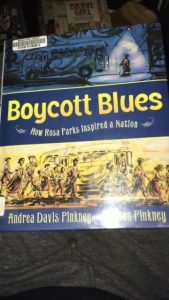 In direct, rhythmic language, Evans portrays children awakened by their parents to join in the 1963 March on Washington for Jobs and Freedom. We see African American families paint signs, travel on buses to Washington, and march with Martin Luther King, Jr. The illustrations show the participation of children in the march and some white citizens marching shoulder to shoulder with black protesters; it ends on a note of hope. Peaceful demonstration in a march for migrant workers’ rights is the focus of Harvesting Hope: The Story of Cesar Chavez by Kathleen Krull, illustrated by Yuyi Morales (Harcourt, 2003). 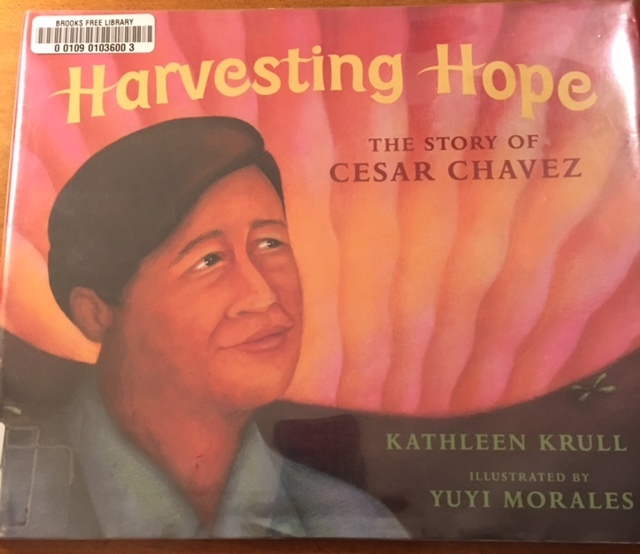 Krull shows us Chavez’s childhood and his rise as a champion for migrant workers in the fields and farms of California, highlighting his dedication to non-violence and the 300-mile march to Sacramento in 1966. Inspiring, positive, with luminous illustrations by Morales. 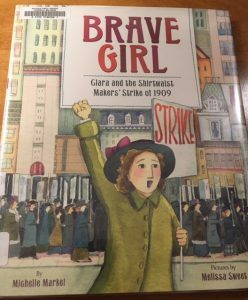 Child labor, immigrant rights, and girl power are entwined in the picture book Brave Girl: Clara and the Shirtwaist Makers’ Strike of 1909 by Michelle Markel, illustrated by Melissa Sweet (Balzer + Bray/HarperCollins, 2013). 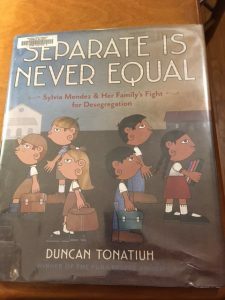 Young immigrant Clara “knows in her bones what is right and what is wrong.” When she goes to work in a garment factory in New York City and experiences its crushing working conditions, she becomes an advocate for the thousands of girls working in factories across the city. 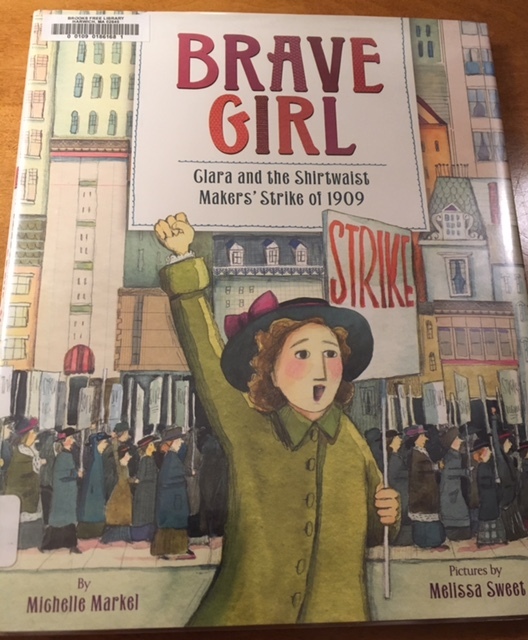 Spurred by Clara’s words, the factory girls stage a strike, marching on the streets of New York, sparking protests in other cities and calls for reform. An inspiring picture book with beautiful language and intricate, artful illustrations. 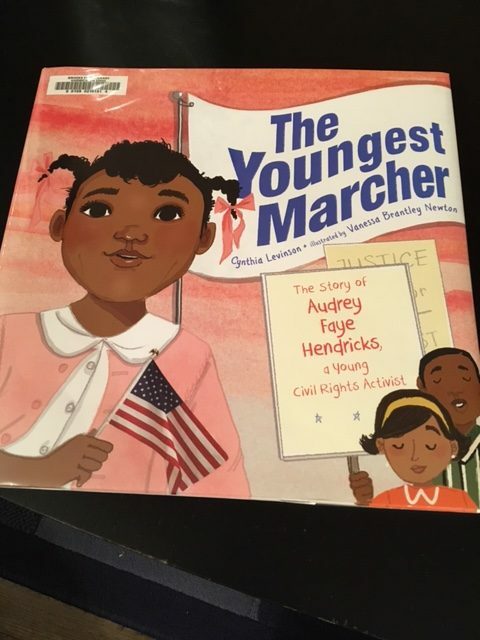 Whether or not you are marching in or attending a Women’s March, these books beautifully lay out the concept of resist for young children. Buy them. Read them to your kids. We’re going to need them.